I’ve been back on the conference scene and was honoured to have been invited back by the organisers (LaingBuisson) to chair one of the sessions at this year’s Private Healthcare Summit. Here’s the inside track on what the private sector is (and isn’t) talking about. The theme of the conference was “Putting the customer first: Exceeding the expectations of patients, doctors and payors”.Pretty spot on topic, given the tsunami of consumerism that is hitting healthcare right now. While the concept of consumerism is largely understood by the sector – lots of nodding heads during the sessions – it remains difficult to embrace, mostly because the way strategy is understood and effected in the sector. My session was on the “Self-Pay Customer”, looking at how to address their needs and expectations. It was a good fit with the conversation that Saffron Steer has been initiating in the sector on how to go ‘beyond product’towards experience. More evidence please: in the age of the customer, we can no longer get away with statements like ‘We know that patients want x, y and z’ without having evidence to support these assertions. Too many presentations made these unsubstantiated claims. There was one exception, from Richard Gregory (Director of Market Engagement, BMI Healthcare) who conducted research to discover how difficult it is for consumers to find the information they need. He used non-healthcare people to navigate websites for information. A notable finding from his research was that, on average, it took these researchers 5 or 6 clicks to find pricing information and when they found it, it wasn’t simple to understand. So, there is space to differentiate here for those willing to simplify and standardise pricing. Increasing demand:chasing self-pay growth is still the only game in town. According to LaingBuisson it has grown by 34% (cumulatively) over the past four years, and on average between 9-12% annually, depending on who you speak to. 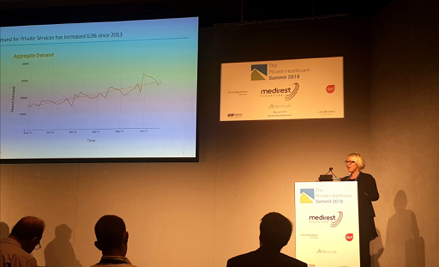 Fleur Hicks (MD of onefourzero) who presented a series of insights mined from internet data on what the healthcare consumer is looking for, told us that demand for #PrivateServiceshas increased 63% since 2013 (see slide alongside). But, the service element isn’t always there: Self-pay is still being approached as an easy ‘plug and play’ initiative, but beware. I’ve been on about this before in my blog from last year on Self-pay: Thinking it through. My advice is to get your self-pay discussions out of the marketing department and into your Board room. Self-pay is a strategic decision you are making to play in the consumer space. It cuts across the talent you need in your organisation to make it work, the culture which will enable you to deliver, the industry position you want to adopt and the customer experience you provide beyond product! Some old thinking prevails: the very outdated marketing funnel made an appearance in one presentation. We are now in 2018 and this linear approach to customer engagement doesn’t work anymore. A decade ago Mckinsey identified that customer decisions are now more of a circular journey. To get on top of self-pay, providers must be aware of these changes. Segmentation, too difficult? Given we were talking about customers all day, you’d imagine that segmentation would’ve been a key word in the proceedings. But, no. 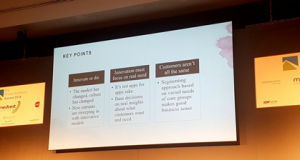 I only heard this mentioned once, by Ed Hudson (MD, Create Health) who presented various personas of customers/patients to press home the need for segmenting audiences properly since all patients and ‘customers aren’t all the same’. Segmentation is not a precise science but needs to be thought through to ensure that marketing messages and services are correctly targeted. I think segmentation isn’t an easy concept, especially when you delve into segmenting based on attitudes and behaviours and not simply on demographic grounds. £20 Billion up for grabs!Much of the chat during the day was about the extra £20bn that the Prime Minister, Theresa May, had announced for the NHS with everyone anticipating her speech later that day on how this would be paid for. 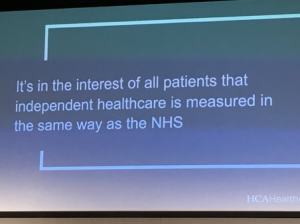 This tweet from the conference feed exemplified the private sector’s position on this new money, “Considerable work is needed to reduce #NHSelective care waiting lists – independent sector capacity will be key to achieving this”. Only one problem, the private sector has a lot of PR work to do to get public support for some of this extra spending to come its way. I’m sure NHS Partner’s Network has got this covered already, but probably a good idea to get some input into shaping the new 10year plan with NHSE. Critical CQC report: The recent CQC report on the state of acute hospitals in the independent sector was high on the agenda. 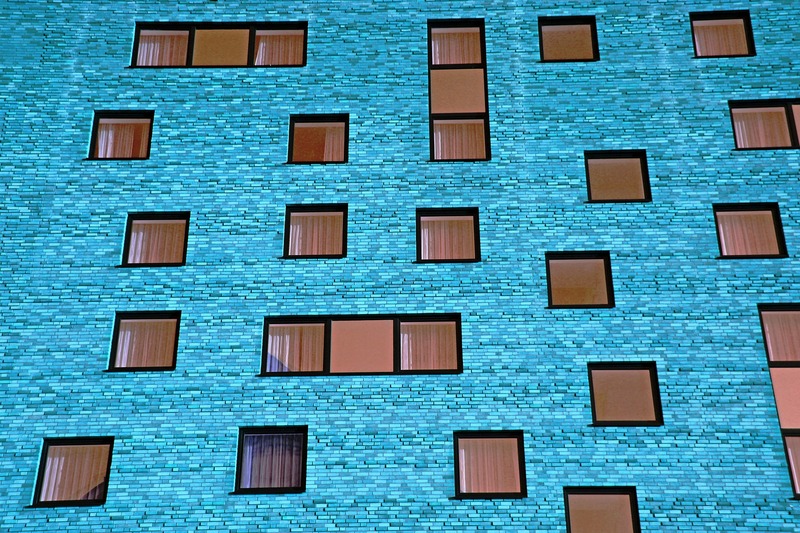 It has been a tough pill to swallow: 30% of private hospitals were considered below standard and needing improvements in leadership, while 41% were identified as needing improvements in safety. A key question raised by an audience member was “What can we do to reassure the public?” The response: ‘Transparency is key to regaining trust and the reporting requirements for PHIN will help us to achieve this’. Another attendee then asked: “Was the CQC report correct? The response to this was “We are learning with the CQC, we are a very responsive sector and since CQC inspections of the sector began there have been significant improvements”. This slide (below) was a great message to all. NO patients as partners: Now, while patients can be described as customers in the private sector (especially if they are self-paying), they can also be very helpful partners. The wave of People Participation, Patient Powered-Health and Patient Leadership is happening, but far more in the NHS and voluntary sectors than in the private sector. Patient/people participation leaders help professionals and healthcare organisations to be true (and equal) partners with patients, services users and carers. There was a noticeable absence of any people participation/patient leadership chat or attendance at this event; surprising given the theme. I have asked the organisers to fix this for the 2019 event. The private sector would do well to embrace this contemporary thinking into its practices and services. They put on a good show in a spacious venue with plenty of great food during the day. I must give a shout-out to Keith Pollard (now Executive Chairman of LaingBuisson International) who is a fantastically entertaining and informed chair who kicked off the conference and chaired many of the plenary sessions. I also loved the interactive ‘at seat’ polling activities as well as the panel discussions format used in many of the sessions. The general vibe was as for previous years, people talking the talk but there are still no compelling examples of the sector walking the walk. 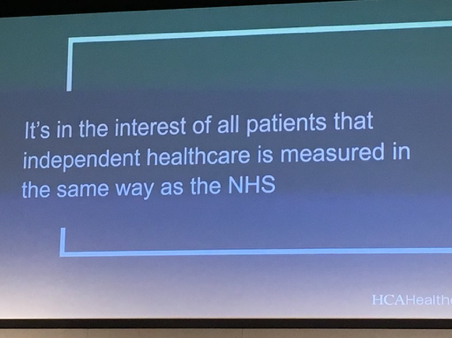 This was exemplified by Cliff Bucknall, HCA UK’s new Medical Director, who rightly observed that the one thing that binds us all together is a sense of wanting the best for patients. I completely agree with the sentiment, but the sector as whole, and every organisation within it, must now start showing that they can deliver on this promise!